The SQL Server and .NET Hub: A DBA or a Database Developer? I often think if the above two roles can be completely separated. From my point of view I would say that this is not 100% possible. Of course, DBAs are not developers and developers are not DBAs. The DBA is responsible for the environmental aspects of a DBMS like the databases integrity, backup, security, installation of new DBMS software, etc. The developer is the person who designs databases and other related database objects. Is the person who writes application code against DBMSs using T-SQL and other data access technologies. 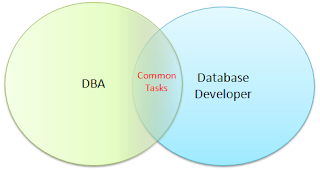 There are many cases where the developer cannot perform the tasks the DBA can. Examples of such tasks are: Implementing High Availability solutions, DBMS security and so on. Also, there are cases where the DBA cannot perform tasks that the developer can. Such tasks can be: Implementing T-SQL queries and other database objects (i.e. stored procedures and functions) that access and modify data. As an example, consider the task of Performance Tuning. In this case the DBA will monitor the DBMS instance for identifying bottlenecks on the memory, disk, CPU and network subsystems which are might caused by the operation of the databases under that DBMS instance. If the DBA discover a bottleneck on the pre-mentioned subsystems then is able to proceed with optimizing the DBMS by upgrading the subsystems causing bottlenecks (i.e. add more RAM) or addressing the issue relatively independently. Though, doing only this is not really enough for performing an efficient and comprehensive performance tuning. Imagine the case where the DBAs runs a trace and finds that a specific database query which exists in a stored procedure and manipulates data has slow performance and needs to be rewritten. In this case the DBA will discuss this with the designer (developer) of the stored procedure in order for the latter to perform the required analysis and then redesign/optimize the stored procedure accordingly. The above example indicates that performance tuning is one of the DBMS tasks which require the cooperation of the DBA and the Database Developer in some of its aspects. Another example within the above context is writing T-SQL queries. Sure, the DBA writes T-SQL queries for administrating the DBMS instance whereas the developer writes T-SQL queries for manipulating data but still, in many cases they both write similar code. So under this context, the DBA should be capable of writing T-SQL queries with ease, not for manipulating data within the databases (this is the developer’s job) but for performing automated, administrative tasks. An example for performing automated tasks in a DBMS is to design and implement a stored procedure which can be executed on a scheduled-time basis. Lately, Business Intelligence (BI) became very popular. 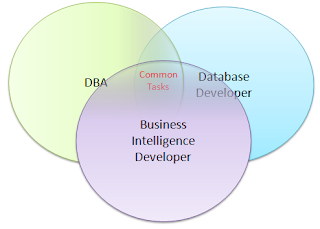 To this end, now there is another DBMS role; the BI Developer. The BI developer is the person who works with business intelligence technologies, in the case of SQL Server, like Reporting Services, Analysis Services, and Integration Services. Is the person who analyzes data in large Data Warehouses and transforms row data into knowledge. Like in the first example, a comprehensive performance tuning would require all three DBMS professionals working together in some of its aspects. Also, all three professionals must be capable of “reading” and writing T-SQL queries. Additionally, all three roles should work together in the case of data archiving and so on. My conclusion is that even though each DBMS role has its own, genuine areas of responsibility where only professionals under that specific role can perform the related tasks, there will always be some tasks which will need the cooperation of all three (or even more) DBMS roles.